Made from hi-tech breathable 2-tone laminated fabric with bonded mesh, the Micro-Lite SoftShell Jacket is ideal for cold and windy weather. It features raglan sleeves with adjustable velcro straps, side elastic, contrast piping, zippered side pockets and a full-length lock zip with storm flap on the front. Please complete the details below. Are your employees always on the go, even during winter or rainy days? If so, you can’t go past promoting your brand with the Micro-Lite Ladies Softshell Jacket. Made for cold and windy weather, these jackets are a great choice for any business. Available in sizes 8 – 18, the Micro-Lite Softshell Jacket is breathable, has natural stretch, is wind cold proof, and comfortable to wear. 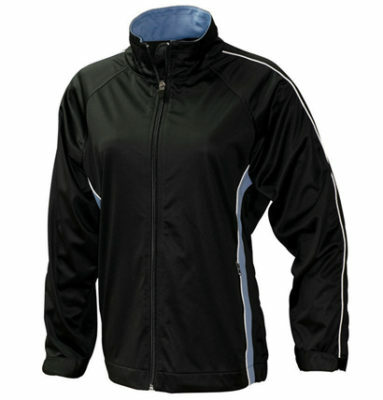 These jackets feature a light, breathable 2-tone fabric, adjustable velcro straps on the sleeves, contrast piping and side panels, zippered side pockets and a full length zipper with storm panels. With your logo or branded screen printed or embroidered on the jacket, the Micro-Lite Ladies Softshell Jacket is a great promotional tool that will show off your brand wherever your staff are. Team up the Ladies jacket with the Men’s jacket for a cohesive overall look for your company branding. Item added to quote cart.